Heroes of the Storm is about to get a few more dragons with the upcoming Dragons of the Nexus. Alexstrasza and Hanzo will both prove to be formidable forces in Blizzard's MOBA, as evidenced by our hands-on time with the two characters at BlizzCon. But there's still some more that Shacknews was looking to learn about the game's latest playable characters. That's why Shacknews stopped for a chat with hero designer Jade Martin and animator Lana Bachynski during BlizzCon's opening day. In addition to discussing what Alexstrasza and Hanzo would bring to the Nexus table, we also discussed what would be coming to Heroes of the Storm, in terms of new gameplay updates and what veterans and newcomers could expect to see in the months ahead. Shacknews: How did the team decide on Alexstrasza and Hanzo for a simultaneous announcement? Jade Martin, Hero Designer: That's a complex question, but we look at our roster of heroes and see maybe who we would like to bring into Heroes and what roles we're looking to fill. So the leads will tend to get together and discuss potential heroes for that and land on what we're looking for. Alexstasza was kind of a hot ticket, because she's a fan-favorite and because she has the ability to transform into a dragon, which we were looking for something unique that this hero could do. So that's pretty much why we decided to go with her, she has a unique silhouette, she can turn into a dragon, she's pretty iconic. When we were looking to follow up, we knew we wanted an assassin. We were looking for support for the Alexstrasza role. When we had Hanzo, we kinda thought it would be fun to do this double dragon... almost a cool double dragon simultaneous announcement. Hanzo is another fan-favorite. There are a bunch of Hanzo mains out there, so we're looking forward to bringing him to the Nexus. Shacknews: How did the team approach Alex's design? How did you settle on the idea of using her human form as the character and her dragon form as the trait? Martin: Matt Villers [Heroes of the Storm game designer] was the principal designer on Alexstrasza and I think the goal was that we wanted her in her human form the most. That's when she's going to be healing, that's when she's going to be with her team, but we wanted to make the Dragonqueen an iconic moment. So when she goes into that, you know you really have to respect her. That's the moment that she's at her most dangerous, she's going to be able to support her team even better than she does in her base form. And part of it, too, is that a dragon's gigantic. I'm sure Lana can speak on that a little more. Dragons are huge, so having a dragon primarily on the battlefield just wouldn't work in our game. It would just be too cumbersome and she would cover the Battleground too much, so we wanted to be able to pick and choose when she could go into that mode, so that's why we separated the two forms. Shacknews: How did you settle on Alex's design here, as opposed to her appearance in other games like World of Warcraft and Hearthstone? Lana Bachynski, Animator: One of the main things we have to consider with Heroes of the Storm is our unique camera perspective. We're a top-down isometric view, 3/4 angle from the top. What can you see? You have to push proportions a little to make a unique silhouette. Approaching the animations, like Jade said, she's huge. She's several inches wide on the screen, massive, she is a force to be reckoned with. That is a wonderful, iconic moment, but very challenging on the animation side. So they actually developed new turning tech, to make sure that when you're navigating around the space, she's following you. When you're turning, she's not just turning on a dime, like many of our heroes do. Heroes is all about the gameplay and responsiveness. She's a dragon, she's gotta feel big. She can't just turn 180 in half a moment. So she turns and you can feel the body, the weight of that dragon, so she feels as mighty as she plays. Shacknews: How closely do Hanzo's abilities in Overwatch translate to the Nexus? Martin: Real close, honestly. Whenever we're looking to transition a hero from Overwatch into the Nexus, we understand there are fans of both games. We want them to feel like they're playing that character, but on the Nexus. We understand we can take a few liberties. His (Q) is Stormbow, he can charge it up like he does in Overwatch. He can channel it in a straight line and channel it indefinitely, up to a maximum distance, then he can let it off, and three seconds later he can cast it again. His (W) is Scatter Arrow, which I think everyone is familiar with. He can fire an arrow and when it hits terrain, it splits into five additional arrows. A really good Hanzo's going to be looking where the enemy's at and picking where they're going to shoot, to try and get that shotgun effect and get some insane burst damage. So you're constantly looking at the terrain with him. One piece of tech we actually introduced with Hanzo was the ability to show the terrain boundaries as he gets close to them. It's cool for his Scatter Arrow, because we actually show you the bank shot, so you'll have an idea of where the Scatter Arrow will happen against that terrain. It also plays really well with his trait, Natural Agility, which allows him to jump over terrain. So to give him mobility, allow him to set up shop and get away from people, and poke from a safe distance. His (E) is Sonic Arrow, which in Overwatch reveals everyone and lets you see through walls. In our game, we don't have X-Ray vision, but we can reveal an area, so you shoot it at a target location and it reveals a large area. It plays really well with Stormbow, because his range is actually longer than his vision range. So by shooting a Sonic Arrow, it reveals a much further area that you can actually start poking people down from. So it gives you that cheating feel of knowing where the enemy's at. Shacknews: So it works similar to Medivh's Raven, where you can reveal a large area? Martin: Exactly! And one of the fun things is, I like to internally call it the "Bullseye Effect." If you shoot Sonic Arrow and it lands on a Hero, it'll follow them around. It's hard to do, because it's a slow-moving skill shot, but when you do it, you score some damage, it follows them around, and you feel really good about yourself. And then there's his Heroic Ability. Dragonstrike is the same Heroic from Overwatch. You shoot an arrow, two twin dragons come out, deal more damage towards the center. 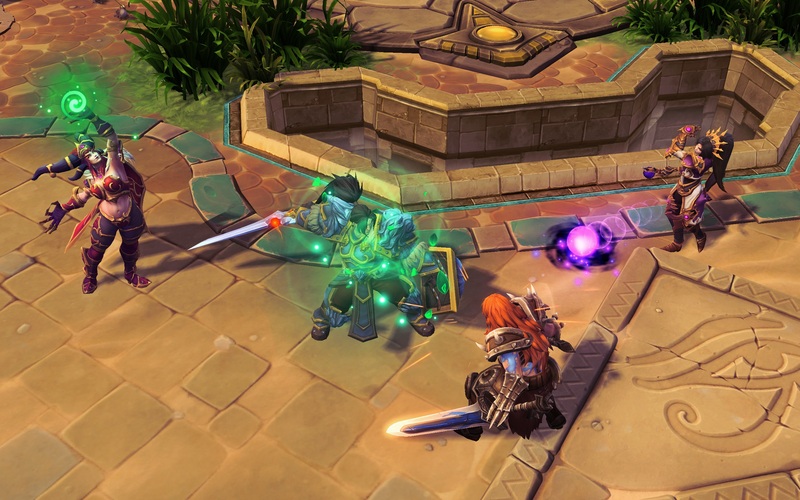 We also do get to take some liberties, and with his second Heroic, that's one of the things we got to do that's unique to Heroes of the Storm with Dragon's Arrow. It's a global ability, he can shoot it and it travels across the map and impacts the first enemy hero hit, stunning them and anyone caught in that blast. Bachynski: And the further away you hit them, the more the damage and the longer the stun. Shacknews: So it's possible to hit from across the map? Martin: Yes! Absolutely! So if I died, resurrected, but my team is still pushing, I can send an arrow down bottom lane and help set up a kill for them. Bachynski: The ultimate long-ranged assassin! 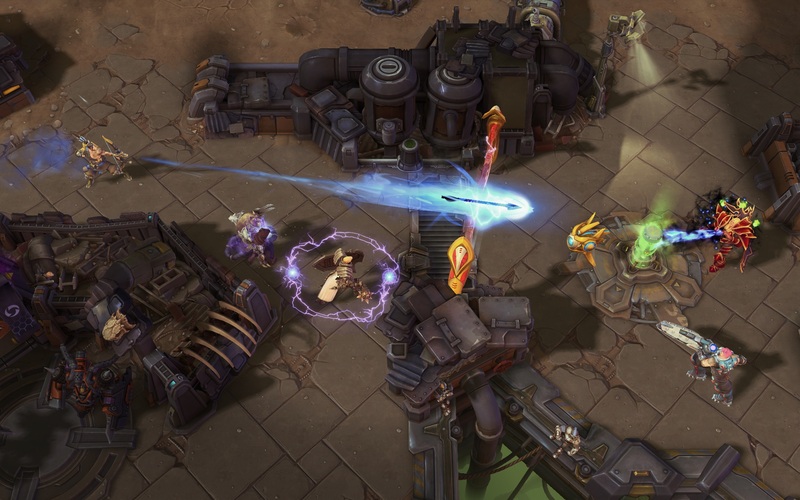 Shacknews: So Heroes of the Storm is getting some major gameplay updates for next year. Can you describe some of the changes that are aimed at casual players and newcomers? Bachynski: One of the ones I'm most excited about is the performance-based matchmaking. I think that's going to be good for everyone all-around. Basically, they've gathered many, many statistics from all the different heroes, and depending on the play style, they realize certain ones are more important per hero. So if you have Illidan, he's going to be tons of damage, capturing merc camps, not dying very often, and there are certain other statistics that are weighed more heavily in analyzing your performance. So rather than just saying "You won or lost," they say "Well, you did really well in that match" so even if you lost, it'll be able to find a better match for you. So people in Quick Match are going to be more likely to find someone that's having a similar experience. Shacknews: It was mentioned in the update page that you've run these changes by professional players and key community members. I'm interested in their feedback to these changes, particularly with the stealth rework. Was the feedback mainly positive or was there concern that the change was too drastic? Martin: Stealth can feel really oppressive for new players. If you haven't played in a MOBA, you're not sure what to look for. And then having a shimmering assassin that you can barely see come out, pop you, and kill you is not very fun to play against. So we're trying to address that and one of those is with the stealth mechanic. As far as the pro scene and the community, when we brought them in, they were actually really excited about it. They thought it was cool, because we're not just changing the stealth, we're also updating those stealth heroes to add some more power to their base kit. Because stealth is so powerful, we had to put a lot of the power into the fact that they could stealth and that made their base kit a little weaker than other heroes. So what this is allowing us to do, is take a little bit out of stealth, put it back into their base kit, and make them more viable in those esports matches. I can give you an example with Valeera. So Valeera relies heavily on stealth, maybe more than any of our other stealth heroes, because she has stealth abilities that she uses. With this stealth update, while people might be able to see her a little better with the shader, you have to really pay attention, because as soon as she gets close to within range, she'll actually teleport to you anytime she casts an ability from stealth. So all of her abilities will actually put her right next to them. So while she maybe lost the ability to really ambush and sneak up on someone, if she's careful with her positioning, she should still be able to get into those positions and get the jump on someone, whereas previously, she might not have been able to. Bachynski: The goal is to pull the power out of the hidden and into the strategic power of the heroes. Martin: Because currently, stealth is an eye test. And if you fail that eye test, you lose out and it doesn't feel good. So we're just trying to fix that, reshift, and balance the power. Shacknews: Lastly, I wanted to ask about battlegrounds. The team has come up with some unique ideas for battlegrounds in 2017. What are some potential ideas being thrown out there for battlegrounds in 2018? Martin: We're always itearing. We just released Volskaya Foundry, which gives you an event that lets you capture a mech if you win the event, and you can pilot and gun it. It's a two-person vehicle, very unique map mechanic. So we're always exploring. I'd love to give you all the ideas we're exploring, but it's probably better we keep them secret. Because in all honesty, things are always changing. We may love something today that we're testing internally, but next week, that could totally change. Something is always evolving in our game, so we never settle on one thing until it's actually shipping out the door. As much as I'd love to go into more detail, I really can't. Look for Alexstrasza and Hanzo to come to the Heroes of the Storm PTR soon. The 2018 Gameplay Updates will also hit the PTR soon, but unlike the shorter character test periods, look for these changes to marinate in the PTR for several weeks, as Blizzard takes player feedback and adjusts things accordingly. Can't wait for Hanzo. His kit looks super fun. Also, nice interview, Ozzie! Those stealth changes are nice. Stealth in HotS really is an eye test, and in certain conditions it was almost impossible to see the stealthed characters (night time on Garden, on Zagara's zerg creep). Taking some of their power out of stealth and putting it into their kit should be better overall. Good Zeratul players might be even scarier with this change since his kit is getting reworked.